Thank you very much for the great review, and I must say I am a fan of your website, always the most useful details are present. I have noticed that you have done a great calibration for the screen, can I ask you if you have used the calibrate display colour tool from windows? In checking this review, I would like to point out something about your Cinebench R15 test. In running my own test using my 7700K (at 4.4GHz specifically), with a lot of programs running in the background (about 140 chrome tabs, steam, playing youtube videos, etc). In essence, this should grant about the same score, since I have a higher background CPU usage and there is only 100MHz clockspeed difference. 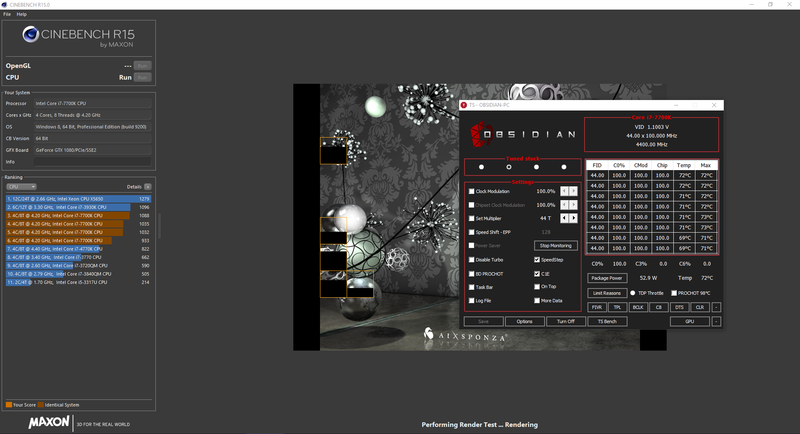 But what I got was a score over 100CB higher than yours for multi-threaded Cinebench R15. I got 923CB, where at 4.3GHz this laptop scored 819CB. This is too close to the 3.5GHz 4-core turbo score of 788CB than what 4.3GHz should be getting. In fact, I then lowered my clockspeed to 4.2GHz, keeping everything up once again, and managed to score 881CB in my next test. This means your CPU was not even close to holding 4GHz in that Cinebench test, and you should probably check it again to see if it was throttling during the run. If I'm going to guess, I would assume 3.7-3.8GHz was held during the test if you tested it with only minimal programs running (as these tests usually are, and really should be, carried out). Huh, it's like Gigabyte forgot Aorus is their premium brand, with Aero 14 costing pretty much the same (and getting a better score lol). A more likely reason behind the CB score disparity may lie in the CPU you used. While the clock speeds were similar, the 7820HK in this notebook is rated at only a 45 W TDP, while the 7700K is rated at a 91 W TDP. The 7700K is a desktop class CPU that can dissipate heat much better and draw more power. While the 7820HK may be throttling, comparing a notebook-class 45 W CPU to a desktop-class 91 W CPU that likely has much better cooling and airflow than a notebook can muster is almost comparing apples to oranges. Maybe more like comparing a Fuji apple to a Granny Smith. The 7700K is going to beat the 7820HK, hands down. It mostly comes down to how much heat the CPU can manage, and how long it can hold its boost. The 7820HK can hit its overclocked boost at 4.4 GHz, but it likely hits it sporadically on various cores. The 7700K can likely hold that speed constant, especially given the immense overclocking headroom the 7700K has (some people can get it to 4.8-5.0 GHz). The 7820HK is really only rated to hit 3.9 GHz, so pushing it to 4.4 GHz is really stressing it; as such, it probably can't hold that as constant as the 7700K just from a power draw standpoint. That said, I wouldn't call this boost clock inconsistency thermal throttling. It's more just pushing the CPU past what it can manage in thermals, power draw, and actual attainable clockspeed. Think of it like this: the 7820HK is like a Honda Civic, while the 7700K is a McLaren. You can tune the Civic and push it to try and hit a 0-60 time that rivals the McLaren, but the Civic isn't really made to do that. As such, the engine will not perform consistently and can't manage that much power. The Civic will get spurts of acceleration that are as fast as the McLaren, but it can't hold that kind of speed over a 500 lap race. A more likely reason behind the CB score disparity may lie in the CPU you used. While the clock speeds were similar, the 7820HK in this notebook is rated at only a 45 W TDP, while the 7700K is rated at a 91 W TDP. The 7700K is a desktop class CPU that can dissipate heat much better and draw more power. While the 7820HK may be throttling, comparing a notebook-class 45 W CPU to a desktop-class 91 W CPU that likely has much better cooling and airflow than a notebook can muster is almost comparing apples to oranges. Maybe more like comparing a Fuji apple to a Granny Smith. Hi Sam, I'm actually using my 7700K in a notebook. A Clevo P870DM3. With my CPU tuned with an undervolt, I pull only around 52W of TDP at 4.4GHz for the cinebench, you can see here. I understand that the 7820HK indeed needs some more voltage for that point and will likely use some more power as a result, but this is part and parcel of overclocking. If the overclocking is to function, TDP limits must be raised. Otherwise, calling it an unlocked chip is entirely useless, because 45W simply is not enough to sustain higher clockspeeds and voltages under any sort of load that constitutes stress. There was a similar problem with Haswell HQ chips, the 4980HQ in particular. The chips were designed to never pass 47W sustained stress, and only lasted a short time at high speeds where short power could be unlocked. I saw users playing games like Battlefield 4 with their CPUs at 4GHz claiming no issues, and when I asked them to unlock the framerate from 60fps they stated that their speeds did indeed drop, and returning their CPU to stock speeds under the 60fps cap showed no change, because there was not a need for the extra power. I'm not denying here that the 7700K is indeed a faster outright chip, and even its default power limits are higher, but to have an automatic overclock option where the chip is not allowed to take extra power means the automatic overclock option might as well not exist. If you have unlocked the power and the chip starts thermal throttling, or has some other form of throttling that cannot be adjusted (current limit is a popular one!) then the unlocked nature of the chip means nothing. Also, I must disagree with the rating of 3.9GHz for the 7820HK. The unlocked monkier invalidates this. It'd be different if there was a 7920HQ (which has +600MHz overclock bin potential, as do all x9xxHQ chips), as that can overclock but is not designed to do so, and having a lock in place for it is perfectly acceptable as those overclock bins are not guaranteed or a selling point. Either way, in this case entirely, I'd have liked to see what clockspeeds it held, and what the reason for throttling was in this particular instance. Even if you've overclocked the chip, once the chip doesn't hold the maximum turbo boost you've set for the designated load (1 core 4.6GHz, 2/3/4 cores 4.4GHz will not need to boost to 4.6GHz for cinebench, of course), it constitutes throttling, and the CPU will report this as such. Throttlestop's limit reasons is a good way to check this; it's had an article published here recently as well. The Aorus X3 V7 DOES have Thunderbolt 3, in fact their entire lineup of V7 notebooks have Thunderbolt 3, it's even right on their product page, so I'm not sure why the reviewer is claiming otherwise. No it doesn't. The latest May 2017 refresh adds TB3 to the X5 and X7 but not the X3 v7. Please read carefully next time to prevent confusion.